Student panelists discussed their experiences as Asian American and how stereotypes have affected their lives a-block of Asian Culture Day in the auditorium. The 12 students on the panel answered questions regarding their cultural identity, how to balance being bi-racial, and how to handle hearing generalizations about Asian-Americans. Even the small number of movies and television shows that have Asians in the spotlight, senior Alexis Chin added, are often filled with stereotypes and generalizations. “Asian’s get such little representation in the media, and I didn’t want to fit the stereotype that the media shows,” Chin said. Not only accepting your race and culture, but also embracing it has proven to be quite difficult for many Asian Americans, Sayeed added. Poet and North Alumni Chen Chen ‘07 recited poems from his book When I Grow Up I Want to Be a List of Further Possibilities b-block of Asian Culture Day. In his poems, Chen referenced events from his personal life, working to connect both the Asian culture and the homosexual culture. He paired the readings with an analysis. During his presentation, Chen described his relationship with his mother, a recurring topic throughout many of his poems. He explains how it affected his family dynamic and whole lifestyle. Chen also talked about many of his ideas for the future of his writing and how he might be straying away from poetry. Rupa Shenoy, a WGBH reporter, who is just one of around sixty people in the country who earn a living from telling stories through podcasts, spoke about her experience and struggles as a female Asian-American reporter during d-block of Asian Culture Day. Shenoy, who is originally from Iowa, was born to Indian immigrant parents. Her first job was at Chicago Reporter. She then worked at Associated Press news in Chicago, then Minnesota Public Radio, and finally at Boston Public Radio. There, she started a podcast in her downtime called ‘Otherhood’ about issues relating to race and identity to help give minorities a voice. Eventually, her podcast was bought by Public Radio International and she went to work at one of their programs, The World, as a podcast host and radio reporter. Even though her podcast has been removed, she continues her own radio stories at her own website. Shenoy added that there are multiple factors that the reporter has to take into account when writing a story. “You have to think about your audience, yourself, and your sources because your story will be out there in the world for everyone to see,” Shenoy said. Shenoy added that one of the hardest things about publishing a story is whether or not it will benefit or hurt the audience and the sources. 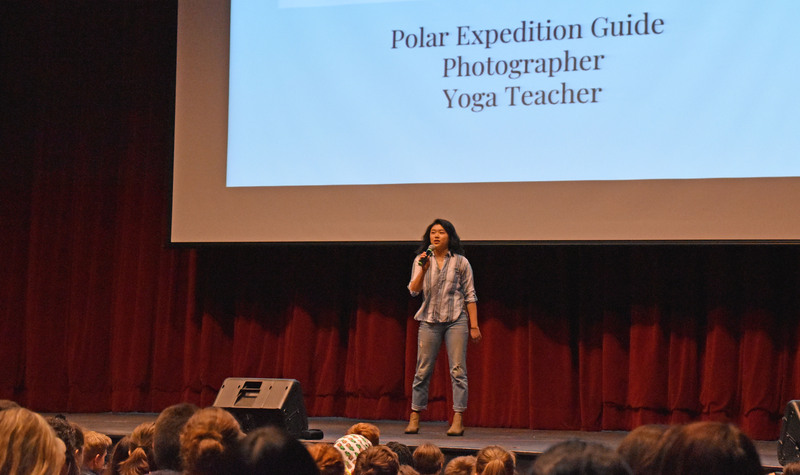 North alumni and professional photographer, Emily Lee ‘16, discussed her experiences with racism and sexism in her fields of work e-block of Asian Culture Day. Lee talked about how she didn’t feel happy until she broke out of her comfort zone and overcame the challenges she faced as an Asian woman, such as people doubting her and labeling her based on stereotypes. She discussed her multiple jobs such as being a yoga instructor, an Arctic expedition guide, a professional photographer, and a podcast host and how they helped her achieve happiness. Lee stayed in California for a while, where she picked up the habit of taking photographs and became interested in photography. Lee then moved to Iceland, wanting to pursue photography, and while there, she discovered yoga. Later on, Lee was commissioned to travel to Antarctica to photograph there. Although Lee did face the feeling that because of her race and gender, she was different than those around her, she learned that if she proved herself, she could overcome anything in her path and be happy. Lee took the initiative to prove herself to her crew, by working hard hours on the ship and slowly, she started to gain their respect. “Sometimes happiness is drinking tequila with a bunch of 40-year-old Russian guys on a rocking boat in the middle of the ocean,” she added. Asian American artists took part in a panel to show and speak about living on an artist’s salary and following one’s passion in the auditorium g-block of Asian Culture Day. The panel consisted of artists Ben Bataclan, Felix Fu, Paul Nguyen, and Eric Pow. A slideshow presented their artwork as they spoke about their experiences as Asian American artists. The panelists spoke about why they became artists, their upbringings, as well as their personal art style. Freshman Tal Pemstein said they enjoyed the presentation. “It was so interesting to hear how the different artists worked so hard and overcame so much pressure, not only from other people but also from themselves in order to become the impressive artists they are today,” Pemstein said. Pow added that he hopes the audience members see that being an artist is a job that anyone can make a living from so long as they work for it. South theater teacher Paige Perkinson informed students about the importance of diversifying theater casts and stories by sharing her own experience with Asian representation in theater f-block of Asian Culture Day. Perkinson said that she hopes theater communities, both in the professional world and high school setting, will embrace inclusiveness. According to Perkinson, the lack of diversity in the theater community during her childhood made her stray away from her Asian roots and want to be white instead. “Growing up, we didn’t see anyone like us Asians on television or in movies, so we felt like we didn’t have an option, since the only option was to be white to play these roles,” Perkinson said. However, with more cultures being represented on screen and on stage in the past few years, Perkinson said she now realizes the importance of representation, and that she strives to represent her culture and become a role model for others.